Beat This Caption Contest 225 Winner – Caption Contest Funny Clever Witty Enter Today! And then she said, Harry watch out for that semi…! 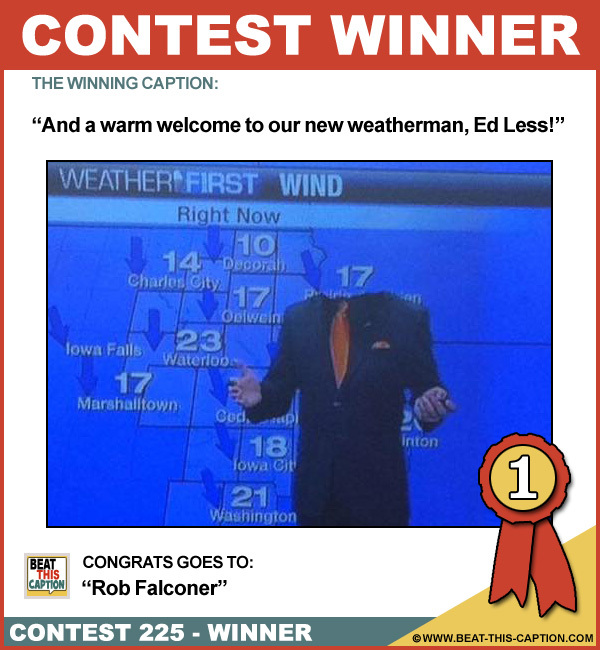 And a warm welcome to our new weatherman, Ed Less! I told my girlfriend, I wanted Head for Christmas! Oh great, so NOW you guys adjust the height of the the overhead fan! Bob had a hell of a time finding just ‘SHOULDERS’ shampoo! Work hard and apply yourself, and in no time you can become the head weatherman! Come on Bill show yourself, your fly was only open for twenty minutes!